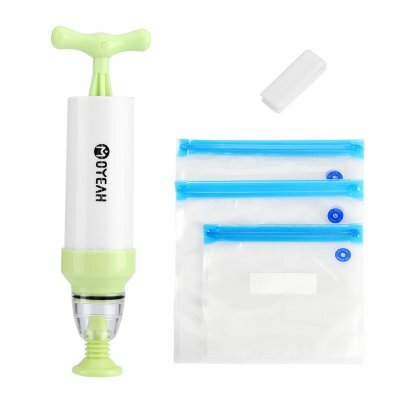 Successfully Added MOYEAH Vacuum Sealer + Food Bags - Double Zip Lock, 10 Food Bags, Reusable 9 Times to your Shopping Cart. Keep food fresh for longer and eliminate food waste with the MOYEAH vacuum sealer hand pump and food bags. Keeping the air out and the freshness in the MOYEAH vacuum sealer can be used time and time again to seal away food helping reduce waste and storage space. The bags are made of a tough PA+PE material and their transparent design makes it easy to pick out the food you want. With a double zip lock, the food bags ensures a strong long air-tight seal that prevents freezer burn, preserves the natural flavor of the food stops odors from spreading and keeps your food fresher for longer. The food bags are also ideal for marinating. The easy operating bags and pump mean you can seal food away in just a few seconds, Coming in 3 different sizes the inexpensive bags let you keep meat, vegetables, snakes, cereals, fruit and other foods fresh and bacteria free, This set contains 3 medium, 8.7x8.3 inch, 1300ml (22x21 cm), 4 large, 10.2x11 inch, 3000ml (26x28 cm) and 3 extra large 8.7x13.4 inch, 3200ml (22x34 cm) bags. Not only can these used at home to reduce storage space but the MOYEAH vacuum sealer and food bags are ideal for camping, picnics, and day trips. The MOYEAH vacuum hand pump and 10 reusable food bags are brought to you by the leader in electronic devices as well as wholesale cool kitchen gadgets and gizmos..
Hand vacuum pump also can be used for clothes vacuum storage bags.